“You think we’ll see some whales today? I ask. “I know we will,” says Artie. Of course I believe him. He’s charismatic enough to be written up in the New Yorker, and judging from the shots he’s getting out here, he knows a thing or two about these whales. We are on the American Princess with a greyed-haired Captain named Tom, Artie Raslich, the official photographer from Gotham Whale, and a couple of researchers trying to record the underwater musings of humpbacks. 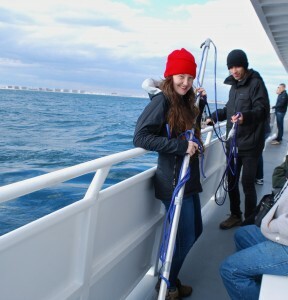 Kristi Collom, the graduate researcher from Hunter College determined to listen in on the whales is also certain; “We saw 75 common dolphins and 3 humpbacks last week. 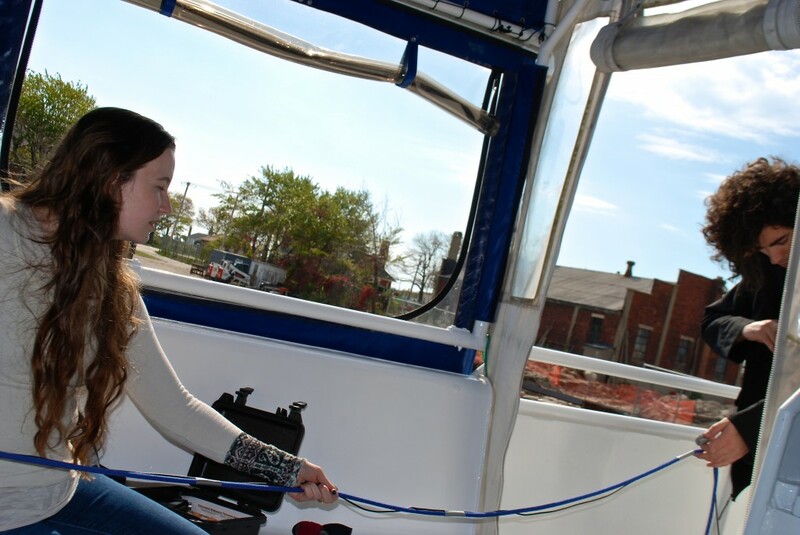 I’m sure we’ll see some more.” Aboard are other “citizen scientists” keeping their eyes on the water, ready to witness, photograph, record and otherwise delight in the antics of marine mammals. We boarded this Princess (the only NOAA certified boat in New York) at Riis Landing, an unassuming dock in Queens in front of Breezy Point, and shortly after noon we are heading around the tip of the Rockaway Peninsula into the open waters five or six miles off New York City’s coastline. Kristi starts working, getting technical help from her partner Mourrice Papi, and they rig a hydrphone with a long lead cord able to descend to a depth of at least 30 feet. We were taking wagers (no money involved) on the exact timing of our would-be encounter. We have a while to wait. Passing the time I ask Artie how he got his celebrated shot of the humpback he named Jerry, surprisingly framed within the outline of the Empire State Building. He was trying for a better composition, he explains, with the whale between the Empire State and the Citibank building. But Jerry breaching the water straight under the Empire State made an indelible impression that turned Gotham’s visiting marine mammals into celebrities. At one point, Artie gesticulates, “He was four feet from the boat with one big eye looking at me. I think he wanted to see who was blasting the Grateful Dead this loud out here.” Clearly Jerry was curious about a Dead Head in a 26-foot long boat. 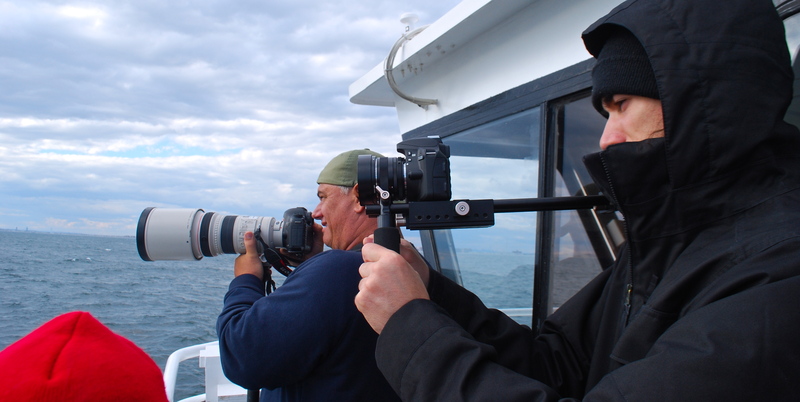 The whale was too close for Artie to get that shot; he couldn’t change lenses fast enough. After three and half hours most of the predictions are well out of the running, as are some seasick passengers. But 2:30 proves to be the magical moment. Artie scrambles to pick up his camera. Mourrice somehow contains his shock of dark corkscrews in a knitted cap for warmth, and the rest of us tumble out onto the deck to see two humpbacks gliding alongside the boat, about 100 yards to the south of us. They appear intermittently, their sleek dark bodies revealing distinctive spinal notches when their backs peek rhythmically on the surface. Another whale joins them, and they come considerably closer. The whales twirl, repeatedly heaving their long white flippers out of the choppy waters. Once in the air they hold them straight up, pausing to point to Far Rockaway, clearly in view off the starboard side. As the humpbacks flirt with our 95-foot boat we wait for the next flipper to slap onto the water with a huge, loud splash. As it does a group cheer of admiration rolls off the boat and over the water. Artie clicks furiously and we rush from port to starboard following their spouts and shimmering footprints as they surface and re submerge in a synchronous duet. 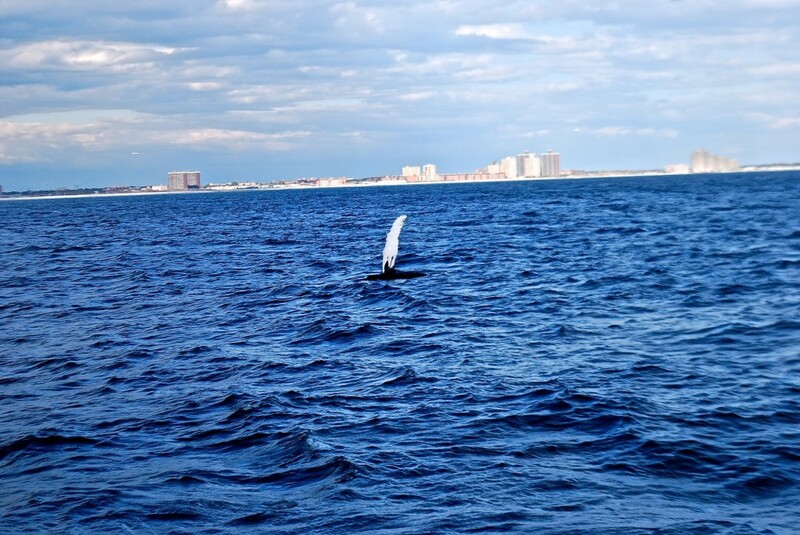 They’ve attracted fans and watchers, and the group of citizen scientists tracking their movements and surprising behaviors calls itself Gotham Whale. Their Director of Education Merryl Kafka was on board with lots of tidbits about the extraordinary lives of whales. University based scientists are also on the trail of Gotham’s humpbacks. Kristi is working with PhD candidate Eric Angel Ramos out of Diana Reiss‘ lab where she studies animal behavior, cognition and communication. The unusual mixing of maritime adventure, animal encounter and marine mammal research is somewhat disarming when Captain Tom cuts the engine and we sit several miles off shore in 80 feet of water, rocking in the long, rolling swells finally reaching us from a southern storm. Engine sounds would overpower the ethereal, underwater utterances of the whales. After the excitement of the humpbacks, this extended quiet is eerily calm. Kristi and Mourrice plunge the hydrophone as deep as they dare beneath the water’s choppy surface. We wait and hope their ingenious rigging will let us all in on the private conversations of our curious companions. We’re late getting back. 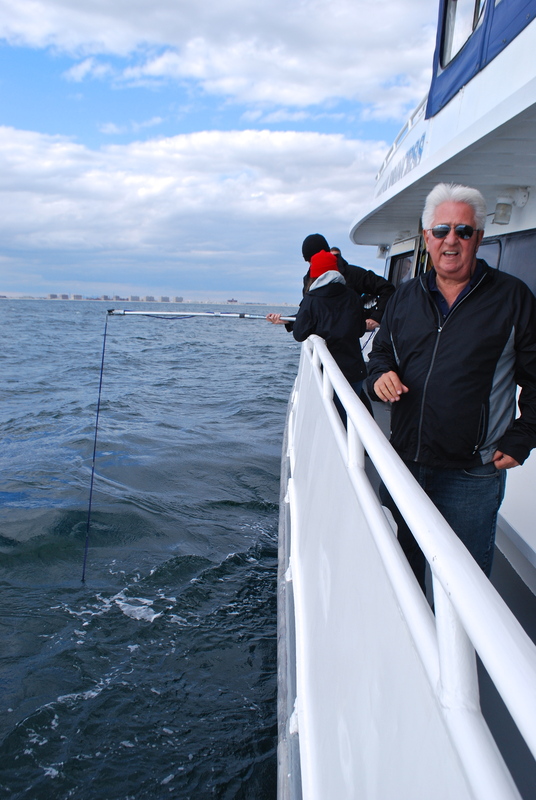 The whales follow us for a time but as the boat heads toward shallow waters, Captain Tom instructs over the PA, “Say goodbye to the whales.” On cue, waving, an entire boat full of people do exactly that. 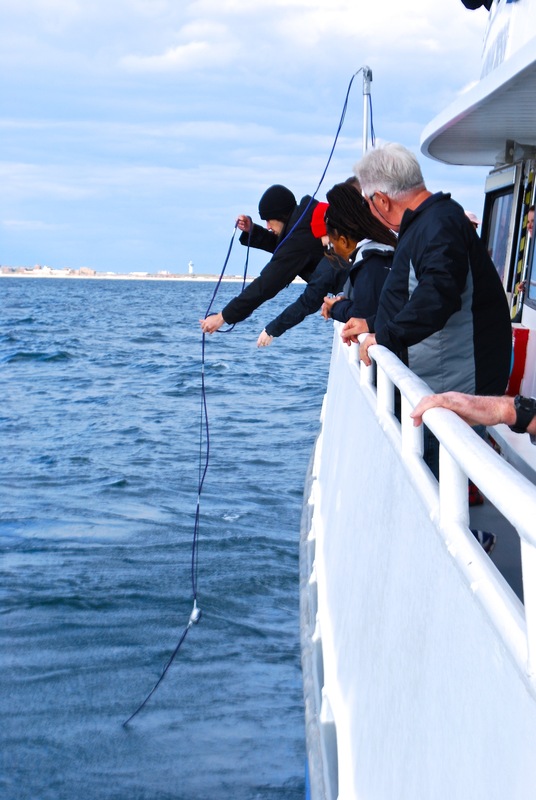 Our weekend was to be the last excursion for the season, but because the whales are still visiting you’ve got another chance to see them this season. The American Princess will go out again Saturday and Sunday, November 1st and 2nd, 2014. Be at Riis Landing to board at least ½ hour early, by 11:30, and shove off at noon.